After Enki Bilal 2 years ago and Jean-Jacques Sempé last year, the city of Semur-en-Auxois and the association Les Amis de la Fontaignotte invite, for its third edition, the designer François Schuiten to exhibit on the walls of the city from June 22 to 31 October 2018 1). About forty works of Schuiten will form a course in the medieval city. The works in large format where reproduced by Atlantic12 2). In parallel with the exhibition in the city, the Museum of Semur-en-Auxois will present about thirty original drawings of François Schuiten. And a room of the library will be dedicated to the passion of François Schuiten: trains. An electric train circuit, models and an exhibition “History of the train in Semur-en-Auxois”. 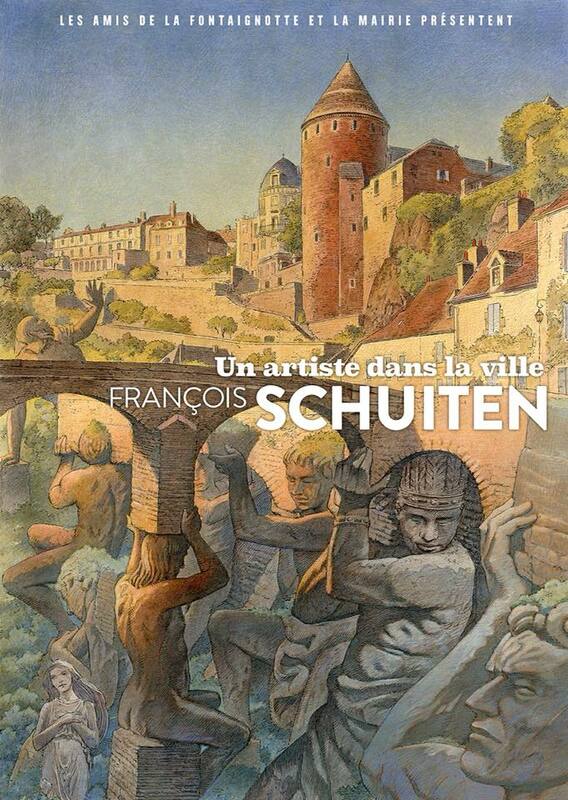 At the opening day François Schuiten made a walk around the artworks in the town. Jeff 3) and Olivier Tissot made the following pictures. On June 22, 2018 the exhibition in the museum was opened after a walk through the city with François Schuiten. Jeff 4) 5) and Olivier Tissot made the following pictures. In the library of Semur-en-Auxois a small exhibition is made in dedication to Schuiten and trains. On June 23, 2018 there was a meeting with François Schuiten in the museum. The pictures were made by Olivier Tissot. and some more pictures of the artwork of François Schuiten in this little town.